Making your business shockproof has just become a whole lot easier since the opening of Netcetera’s planB. The business held an open evening for over 65 invited guests to launch DR.IM as well as the company’s new flagship Business Recovery Centre, planB. The new facility was officially opened by the Isle Of Man’s Chief Minister The Right Honourable Allan Bell, MHK. The feedback from those of you who did manage to attend has been excellent. It was interesting to hear that many of the businesses represented on the night had a Business Recovery Plan in place, just as interesting but a little concerning was to hear that some hadn’t tested their plan on a regular basis neither examined whether their current plan offered value for money. Guests were given the opportunity to view first hand the fantastic new facility and find out a little more about the benefits of Disaster Recovery and Business Continuity with planB. Friendly staff team with a can do attitude, to be there for you when you need them most. All of this is backed up by our 20 years of dedicated commitment towards giving our clients the best customer service and technical support available. There are no negatives about planning ahead. Having a Recovery Plan from Netcetera can not only reduce your current outgoings but it can also safeguard your business’s future. With Business Recovery being a necessity for many companies to maintain regulatory compliance the new facility was warmly welcomed by those present. Having a planB from Netcetera gives your business a competitive edge should an occurrence take place that causes disruption, whether through a natural disaster like a fire or flood or through human error. Regardless of the situation you may find yourself in, planB can ensure it’s business as usual. PlanB gives you the ability to operate as normal, in a seamless manner, regardless of what disruptions your business may face. Not only was the new Business Recovery Centre launch a huge success but the company also launched DR.IM, an exciting new recovery and IT Backup Solution. One of the most reliable, manageable and cost effective available on the market. 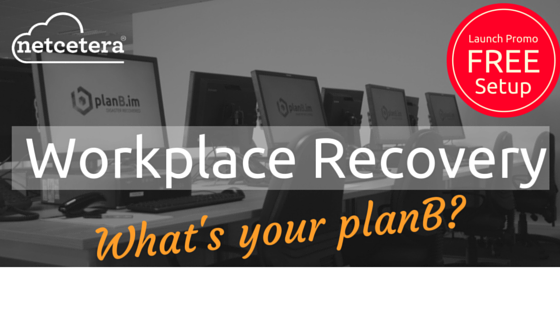 With DR.IM and Netcetera’s planB we have you covered, leaving you to get on with running your business. Simple, affordable, seamless recovery from Netcetera.